4-hour quick recharge and minimum 70 hours of memory makes it well suited for MR applications. The 7500FO provides a variety of display indicators that ensure reliable readings. Pulse Strength Bar Graph Color coded bar graph assists in assessing the patient's status. An audible tone sounds with each pulse. The pitch changes with the patient's saturation level. 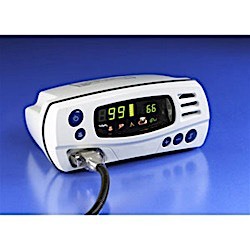 Pulse Quality Indicator Detects patient movement or signal quality changes that may require sensor site stabilization. Sensor Fault Indicator Indicates when a sensor has become disconnected, misaligned, failed, or is incompatible with the monitor. A quick and complete assessment of your patient's oximetry readings is made easier with the combination of information supplied by the Pulse Strength Bar Graph, variable pitch pulse/saturation tones and Pulse Quality Indicator.